Nine years ago we had the opportunity to go on our first incentive trip with Stampin’ Up! We had never been on a cruise ship but I had seen them in the distance. As we approach our ship to board, I was blown away by the size! How in the world would such a massive vessel stay afloat? We settled in and took time to get acquainted with our floating hotel. After dinner we walked around the top deck, enjoyed the starry sky, and retired for the night. I enjoyed being rocked to sleep with the gentle motion of the ship. We even opened the sliding door a bit to enjoy the sound of the water swishing underneath us. The next morning I awoke and stepped onto the veranda. I could not believe what I saw—- there was water as far as my eyes could see! Nothing but ocean! It was at that moment I realized how big God is. 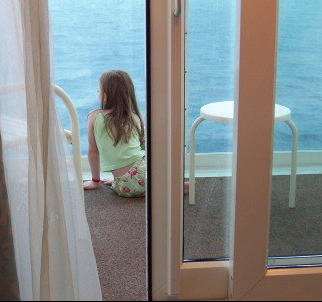 On this enormous ocean with waters so deep and waves moving about, there I was—little me on this huge ship that looked like a wee toy on a ginormous body water. He created it all and yet, He cares for every tiny detail in the world simultaneously…. that is astounding! When a problem or situation seems huge I find it helpful to recall that moment in time to remember my God is bigger than anything. Have you been on the ocean? Have you stood at the top of a peak? Perhaps you’ve stood atop a manmade structure that towered over a city? I like putting things into perspective, don’t you? “Your love, O Eternal One, towers high into the heavens. Your justice is like the majestic mountains. Your strong love, O True God, is precious.